Proud of your British heritage? Obsessed with everything Great Britain? 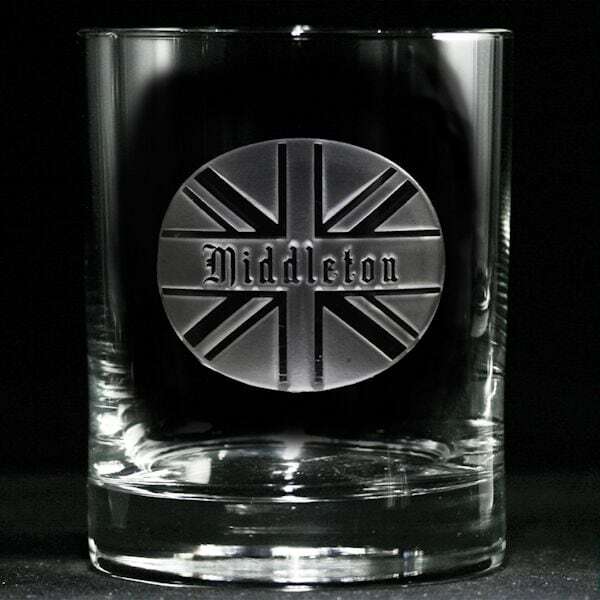 This personalized British pride whiskey glass celebrates your lineage in style. A flowing name banner features your last name to personalize this whiskey glass for you. 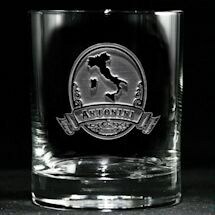 Made from carving out a deep background panel, sand carving leaves the lettering and design elements untouched and raised from the glass surface in a truly stunning 3D manner. The effect is much deeper than laser engraving, and the impact is sure to impress the recipient. Personalize with name up to 14 characters. 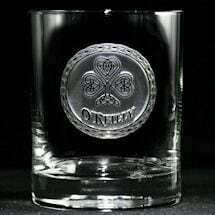 Whiskey glass holds 13.5 oz. Dishwasher safe. Made in the USA. Please allow 2 weeks for delivery. No rush delivery or gift box. Item can only be shipped within the Continental US.